With four albums in the Rolling Stone ‘500 Greatest Albums of all Time’ list, Elvis Costello is a true songwriting legend – reuniting with the Imposters and returning to the stage for three select indoor concerts this summer. 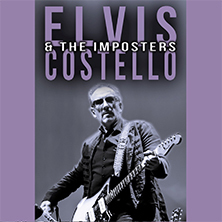 Performing old songs and new in a show not to be missed that promises to satisfy all, don’t miss [artistlink slug="elvis-costello-the-imposters"]Elvis Costello & The Imposters[/artistlink] in Nottingham, Southend and Plymouth this June. Page generated in 0,139056 seconds.